Julie Bishop at the Women of the Future Awards last night. Pic: Ryan Pierse, Getty. 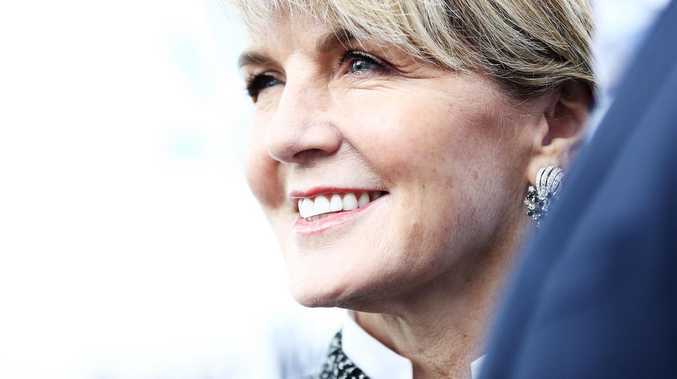 FREE from the constraints of the deputy leadership after more than a decade in the job, Julie Bishop is now speaking openly about the Liberal Party's treatment of women. Ms Bishop was remarkably blunt when she spoke at The Australian Women's Weekly Women of the Future awards yesterday. She condemned the "appalling behaviour" she had witnessed in parliament and shamed her own party for its failure to increase the number of female parliamentarians in its ranks. Just 22 of the Liberals' 99 MPs and senators are women. "I say to my party, it is not acceptable for us to have less than 25 per cent of our parliamentarians as female," Ms Bishop said. "There's a lot to be done and I'm committed to helping do it." But this argument stands in stark contrast to what Ms Bishop has always maintained. She has long been opposed to what many would consider the obvious solution - a quota. Labor introduced one in 1994, mandating that it select female candidates in 35 per cent of winnable seats by the year 2002. Having passed that mark, in 2015 it settled on a new quota of 50 per cent by 2025. The strategy appears to have worked. While the proportion of women in the Liberal Party has inched up at a maddeningly slow pace, Labor's figure is already approaching its goal. The Liberals also want to reach 50 per cent by 2025, but they are hoping to achieve it through a non-binding target, rather than a quota. Why is there such resistance to the idea? Because it would contradict the party's philosophy, which posits that women will grow in number through merit alone. Few Liberals explain the argument better than Ms Bishop herself. "I do not support a formal quota system for achieving greater representation in parliament," she wrote in a 2015 column for Mamamia. "Most women wish to be selected on their merits and on the basis that they are the best person for the role, not because of their gender." Ms Bishop said Labor's policy "offers little protection against factional influences" inside the party. "The Labor Party embraces affirmative action but in practice it is invariably abandoned when a male union boss, for example, claims a seat that would otherwise be reserved for a woman," she said. Malcolm Turnbull, another leading voice from the Liberals' moderate wing, has previously mounted the case against quotas as well. "You've got to understand how our party works," the now former prime minister once told The Australian Financial Review, saying the Liberals would "never" agree to the idea. "The Liberal Party members … don't want to be told that they can only choose a woman or a man. They choose the best candidate. And I think that's fair enough." But with female representation stagnating and the gap between the two major parties widening, the "meritocracy" argument, that there is no need affirmative action, is looking more and more like a myth - one that is finally being acknowledged, albeit reluctantly. "I have never been a fan of quotas, but they may be the Liberals' only hope to win back female supporters," Mr Turnbull's daughter Daisy said today. She said the "family-unfriendly" nature of parliament was "not enough of a reason" for the Liberal Party's persistent gender gap. Julia Banks - who recently announced she would not contest the next election, citing the "bullying and intimidation" she had encountered in parliament - is one MP who has voiced support for "hard targets". In other words, targets that are actually enforced, instead of being allowed to pass unfulfilled without consequence. Ms Banks was the only Liberal candidate to win a seat off Labor at the last election. Her electorate, Chisolm, had eluded capture for 18 years. The party would be wise to heed her advice. "I am not giving up the fight for gender equality. The scourge of cultural and gender bias, bullying and intimidation continues against women in politics," Ms Banks said when she announced her decision to quit. That toxic atmosphere is the other element that discourages women from entering politics. 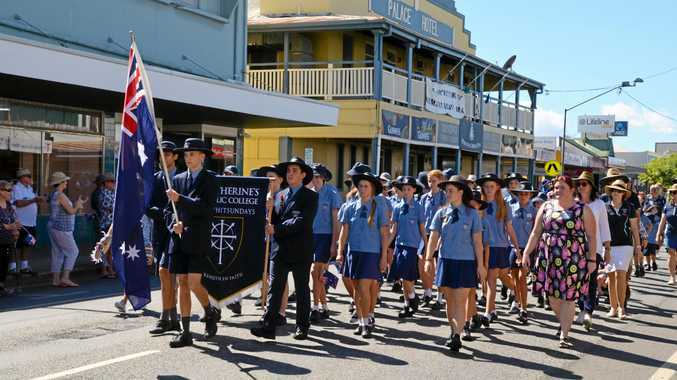 In her speech yesterday, Ms Bishop addressed it head-on, saying some of the conduct she had seen in Canberra "would not be tolerated in any other workplace across Australia". "I have seen and witnessed and experienced some appalling behaviour in parliament, the kind of behaviour that, 20 years ago when I was managing partner of a law firm of 200 employees, I would never have accepted. But in parliament, it's the norm," she said. "Unacceptable workplace practices are the responsibility of us all to identify, to stop it, to fix it. "When a feisty, amazing woman like Julia Banks says this environment is not for me, don't say 'toughen up princess', say 'enough is enough'." That last part might have been a reference to radio host Alan Jones, who told Ms Banks to "take a teaspoon full of cement and toughen up" when he appeared on Q&A this week. Today some questioned why Ms Bishop didn't speak out about this subject sooner, given her powerful position. "Julie Bishop has been deputy leader for a few years now and if the bullying is so bad, why did she not speak up about it as deputy leader? Why did she not do something about it? It's certainly not acceptable, but she's been in a position to do something about it," 3AW's Tom Elliott told Sunrise this morning. "Let's say she had won the leadership ballot. Would she be criticising the system now? No, she would not. She had plenty of time when she was in power to do something about it. Why wait until now? "If you don't use the power when you have it, it is hard to criticise after the fact." But Ms Bishop's colleague Josh Frydenberg - the man who replaced her as deputy leader - backed her up, telling Seven she was "absolutely right". He agreed that women were under-represented in the party. "The fact is we do need to see more female representation in parliament, and in my first speech to the party room after being elected as deputy leader, I said exactly that. I said we need to get more women not just into marginal seats, but safe seats," Mr Frydenberg said. No one disagrees that the number of women in parliament needs to increase. The question is how - particularly if a quota is off the table. The ABC recently dug up a damning and revealing statistic. Of the 38 female candidates the Liberals put forward at the last election, just three were preselected for safe seats. As long as the men maintain a monopoly on those seats, it will be virtually impossible to fix the party's gender imbalance.